History: Hardy is not individually registered with the NGA, although 5 of his siblings are. His dam is CTW Paris Amour (also dam to CTW Palm Reader [Koko] and CTW Paper Moon [Moonie]) and his sire is the famous Trent Lee. As is standard with Trent Lee, all of his offspring are either blue or black. Apparently it was obvious from an early age that Hardy was not racing material. His name, Party Hardy, may have been a self-fulfilling prophecy. He was not focused on racing. He would rather party than work. Of course, being a gorgeous blue boy he may have gotten along on his looks instead of his prowess. We will know more about how Hardy reacts to home life after he settles in a bit. Not individually register on Greyhound-Data.com. 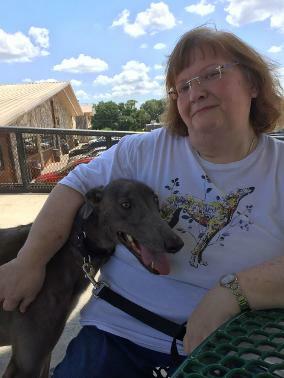 Hardy with his new mom, Kathy! 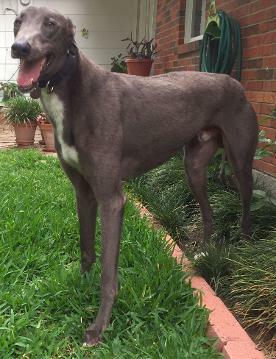 August 20, 2017 update: Hardy has found his forever home in Houston with his mom, Kathy, and TAGS alum, Dancin, and other greys and galgos and kitties. 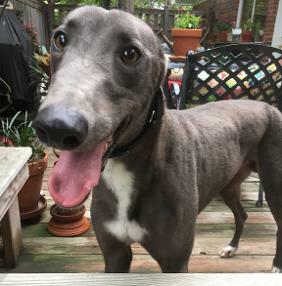 June 14, 2017 update: Hardy is a sweet boy who loves to be by your side! He is very curious about things and loves anything that squeaks! He wants as many snuggles as you can give him. He is cat tolerant - pays them no attention actually. Hardy is also small dog tolerant. He does well around kids, too, but doesn't interact with them much. 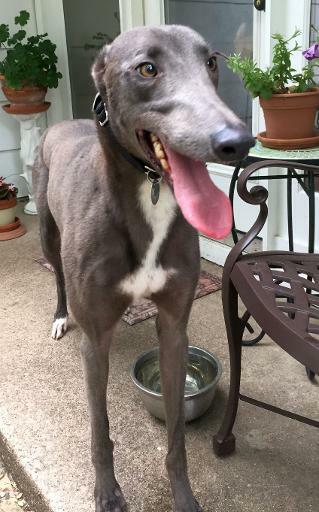 Hardy is a very gentle soul and would do best with other greyhounds; he likes to follow the pack! In addition to all of those good things, Hardy is house trained now and is just about leash trained as well. He is particular about which bed he wants but doesn't force the issue. He just lays down in front of it until it's available. 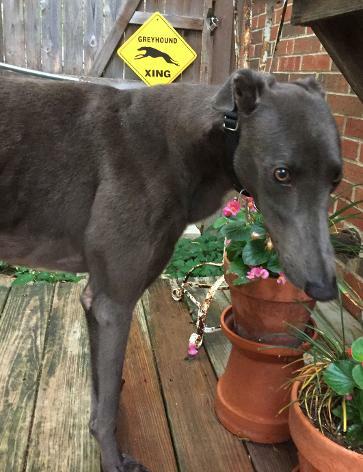 He’s such a patient boy – also patiently waiting for his forever home. 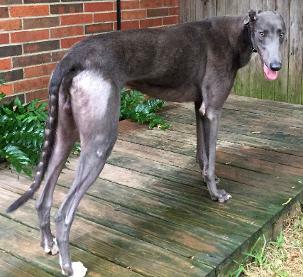 May 26, 2017 update: Hardy came to TAGS for a life of retirement and to find his loving lifetime home.